It was the Wert-spotting by Jalopnik reader Nick outside the Shelby HQ gave us an idea for our run through Death Valley yesterday on our Shelby GT500KR Road Trip. Would the car spies spending the summer months in the Valley of non-Life find the GT500KR with manufacturer plates a compelling enough target to shoot — perhaps thinking it to be some kind of development mule? After a quick 150 mile jaunt through the Valley's 110-degree temperatures yesterday afternoon, we found the answer to be "No." KGP's Glenn Paulina radioed in late yesterday he spotted us winding our way through Mud Canyon but wasn't fooled by our manufacturer plate. Instead, he was too busy looking for other M-plated Fords in case it was part of a test group. And despite the shot above, Brenda Priddy wasn't fooled either— she'd seen the posts about our plans to hit the Valley — but she did take a moment out of her spy shooting day to run us down, catching up to us in the Super-Stang after pulling us over to warn us to drink lots of water in the hot desert sun. Maybe next time we'll strap garbage bags to the taillights Winding Road-style. 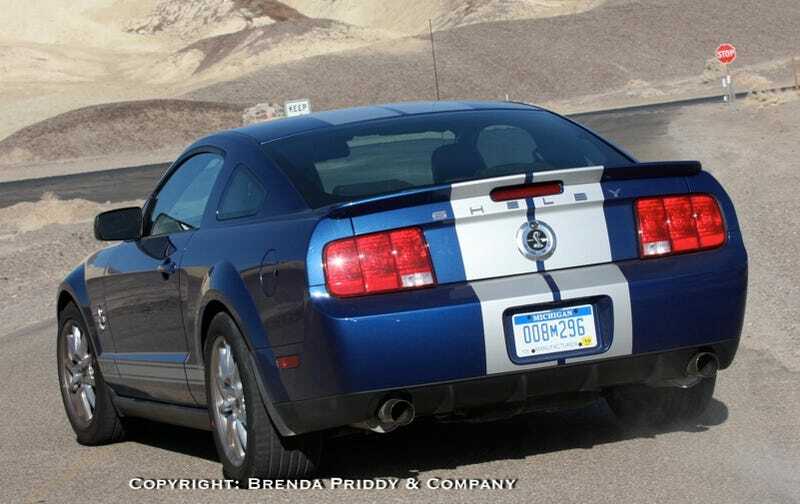 Follow along at our tag page for our full three-day four-day Shelby GT500KR Road Trip!